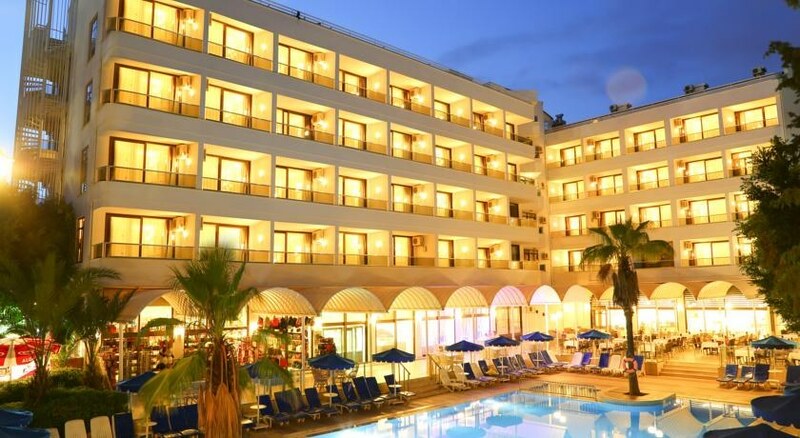 The Hotel Kaya Maris is a 4-star complex set in Marmaris, providing guests with an idyllic setting and all that they need to relax and unwind. The hotel has its own outdoor pool and with the beach just a short walk away, the beach is always an option. There are plenty of dining options in the hotel and the surrounding area while there is plenty to keep the little ones busy throughout the day. 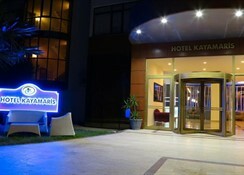 The hotel Kaya Maris offers a comfortable stay in a great location, ensuring that guests can take all that they want from their perfect holiday. The hotel is perfectly located for those who love sea views while having the ability to either relax or make the most of the bustling town of Marmaris. There is plenty for guests to take advantage of in the area. They can embrace the golden beaches and water sports or they can experience the thrill of the many water parks in the area. Guests can head into the centre of Marmaris where they will find restaurants and bars that are ideal for families or those who like a lively atmosphere. Whatever guests are looking for, the location of Hotel Kaya Maris makes it possible for all to find exactly what they want. The airport is 90km away from the hotel. The hotel has a total of 109 rooms and all come with a classic design and decor, providing guests with a comfortable stay and plenty of space. All rooms are Double Rooms and they all offer a selection of facilities including a balcony, private bathroom, safety deposit box, telephone, TV, air conditioning and mini bar. Guests who enjoy fine dining will be able to embrace the dining options available here. There is an array of stunning dishes available during breakfast and lunch as well as Turkish and international dishes during dinner at the buffet restaurant. There is also an a la carte restaurant that has a relaxing atmosphere where guests are served a selection of mouthwatering meals. For those looking for something different can venture out of the complex and try out some of the many restaurants available in the area. When the time comes for guests to look for a refreshing drink, the dolphin bar is the place to go. The complex offers guests the chance to relax around the outdoor pool while enjoying the wonderful sea views. For those who like to take it easy, the wellness centre is the perfect way for guests to take advantage of a number of treatments and massages as well as use the fitness centre. There are also a number of sports available including billiards, table tennis, diving, parasailing, jet skiing, windsurfing and sailing. There is also a games room and a playground that will keep the little ones busy for hours. This was our first visit to Turkey and after reading some reviews about this hotel we are slightly concerned but there really wad no need. We arrived in early hours and had a no fuss check-in and were taken to our room. The room was very clean with water in the fridge. We were do tired we went straight to bed. Following morning up for breakfast, varied choice of good including fresh eggs, omelettes and pancakes,cooked outside, also an array of juices, coffee, tea and water. Lunch again plenty of choice and evening meals were good, always a chicken dish but all was tasty. The pool wasn't heated but it was very hot so was nice to plunge in but not for long! The staff can't do enough for you, pleasant and attentive. The bar opened at 10.30 which was plenty early enough for us! The hotel is situated 50 mtrs from the beach and walkway, there are limited sunbeds on the beach so you need to be up early doors. The walk way is lovely with an array of bars and restaurants to choose from if you fancy a change. We can definitely recommend Blackpool Bar! So all in all great hotel, staf, food etc if we had anything to improve it would be the mattresses -very hard but you do get used to it! Hotel was clean, some staff were friendly others could not be bothered. The bar opened at 10am in the morning and closed 11pm and there was only one bar. The meals were ok but not a lot of it. Once the item of food had been taken there was no replacement it was a case of first come first served. There was also not a lot of variety. I would not recommend this hotel.